﻿ Cellex Unlimited Powder 520 Gr - Amix Bulking Free Shipping! Prepare your training AMIX ™ CELLEX ™ Unlimited 520 gr an explosion then nutritional synergy to increase the volume of your muscles. 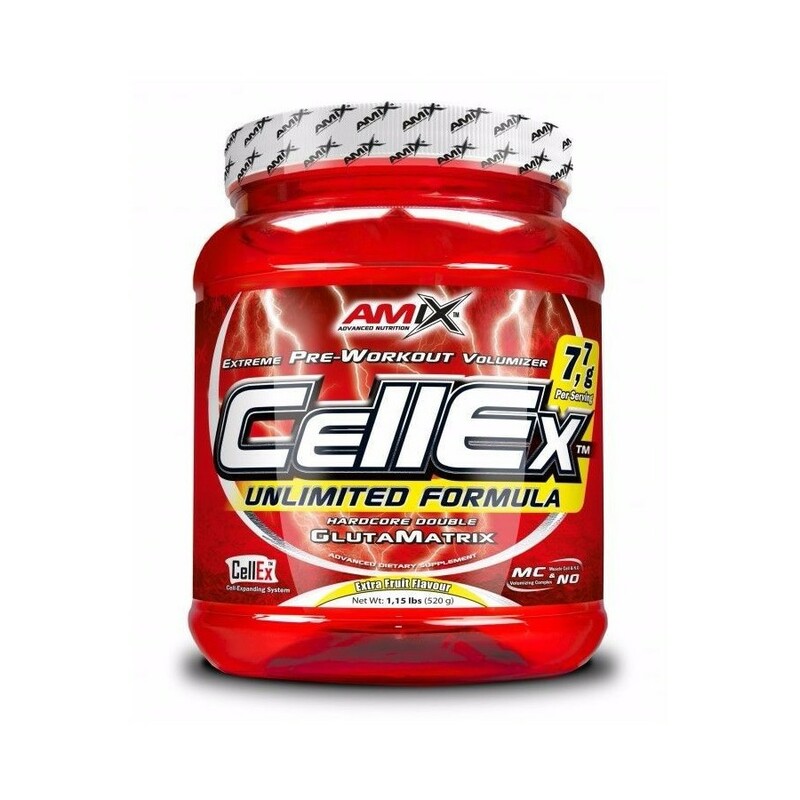 AMIX ™ CELLEX ™ 520 gr Unlimited is a dietary supplement indicated to consume before training. Arise with power, think of exercise that you have planned to do: weightlifting, bodybuilding, fitness? To address these daily challenges, taken before training this explosive combination of Amix ™, specializing in sports nutrition brand with international recognition. Includes innovative formula Cellex MC & NO (Muscle Cell & Nitric Oxide Volumizing Complex), which contains a database of creatine made by Kre-Alkalyn, Beta-Alanine Dual Action Action Matrix (CarnoSyn TM), malate Tricreatine, which together with L- Arginine Alpha Ketoglutarate (A-AKG) has volumizing effects and transported by the bloodstream smoothly. AMIX ™ CELLEX ™ Unlimited added 520 g citrulline malate, which helps regenerate ATP and destroy the lactic acid produced in days of intense activity being the cause of the laces; taurine, to revitalize and awaken your full potential; betaine, whose function is to intervene in the synthesis of nucleic acids; and supplemented with caffeine acting as burning fat. 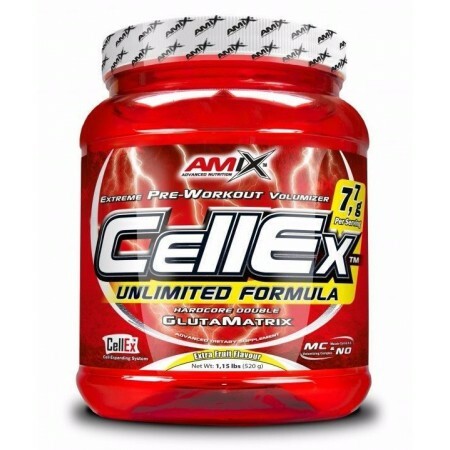 AMIX ™ CELLEX ™ 520 gr Unlimited is an explosive source of lasting energy. Its composition aims to provide good hydration through its Cellex formula glyceric polymers, whose elements are the di-calcium phosphate, di-potassium phosphate, di-sodium phosphate. It also retains an important content of glutamine, the most abundant amino acid in the muscula mass without this element which is difficult to grow muscle. Alpha Ketoglutarate Glutamine together with N. Acetul Glutamine have a synergy effect which is really effective: first power growth hormones, second helps recharge muscle glycogen, enhancing recovery capacity and accentuating highlights . A combination that gives states ideal concentration for any sport that requires strength and strategy. Dilute 26 grams and drink 200-300 ml half an hour before training. The days when no training take 25 grams with 200-300 ml of water on an empty stomach. Cellex MC & NO (Nitric Oxide Cell & Muscle Volumizing Complex): 7,710 g.
Kre-Alkalyn, Beta-Alanine Dual Action Matrix (CarnoSyn TM), L-Arginine Alpha Ketoglutarate (A-AKG), Tricreatine malate, L-citrulline malate, micronized Taurine, hidroclorhidrato betaine, caffeine, cinulina pf. Di-calcium phosphate, di-potassium phosphate, di-sodium phosphate. Other Ingredients: glucose polymers (maltodextrin), citric acid, Mono-sodium glycine carbonate, natural flavors and natural identical flavor, sucralose (Splenda), acesulfame k, silicon dioxide.